That raises the question: Do justices who are younger when they join the court actually end up serving longer than older appointees? Not surprisingly, the answer is yes, though there are plenty of exceptions. The youngest new Supreme Court justice ever was Joseph Story, who joined the court in 1812 at age 32. The oldest was Horace Lurton, who became a justice in 1910 at 65. Most new justices were in their 50s when sworn in (58 of 104 when excluding those currently serving). By contrast, only four justices were younger than 40 when they joined the court. The Constitution does not specify a minimum or maximum age for serving on the court. 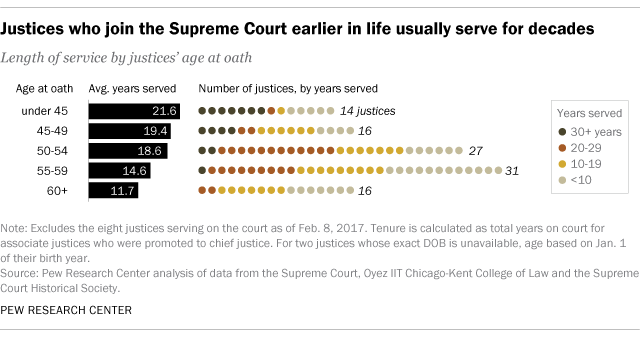 When considering all former justices, newly installed members were an average of 53 years old when they were sworn in, served for an average of 16.9 years and ended their tenure at an average age of 69. If you factor in the eight current members of the court, these figures barely change. Gorsuch, who was nominated by Trump on Jan. 31 to replace the late Antonin Scalia, would be slightly younger than the average new justice if he is confirmed by the Senate and takes the oath of office before the end of court’s current term this summer. (He turns 50 at the end of August.) But he would still be older upon joining the court than one current member of the court was: Clarence Thomas was 43 when he became an associate justice in 1991. Two other current members of the court, Chief Justice John Roberts and Associate Justice Elena Kagan, were 50 when they were sworn in. While younger justices have tended to serve longer on average, there are plenty of examples of older appointees staying on the court for a period that exceeds the historical average. For instance, current Associate Justice Ruth Bader Ginsburg was 60 when she joined the court in 1993 and has served 23.5 years. Harry Blackmun was 61 when he joined in 1970; he eventually served 24.2 years. And Oliver Wendell Holmes Jr., who was also 61 when he took the oath in 1902, ended up serving 29.1 years, leaving the bench when he was 90. There are also quite a few examples of justices who served for relatively short periods despite being comparatively young when they took the oath. Alfred Moore, who took his oath in 1800 at the age of 44, served just 3.8 years. James Iredell, who was 38 when he joined the court in 1790, served 9.4 years. And John Jay, who was 43 when he became the nation’s first chief justice in 1789, served 5.7 years before leaving the post to serve as governor of New York. Among more recent justices, Arthur Joseph Goldberg, who was 54 when he joined the court after being nominated by John F. Kennedy, stepped down less than three years later to become the U.S. ambassador to the United Nations. (Goldberg moved to the UN at the request of Kennedy’s successor, Lyndon Johnson, but later said he regretted the decision.) Goldberg’s replacement on the court, Abe Fortas, was 55 when he joined the court but served only 3.6 years – well below average for justices in their 50s. The longest-serving Supreme Court justice in history was William O. Douglas, who remained on the court for 36.6 years before stepping aside in 1975 at the age of 77. The shortest-serving was James Byrnes, who stayed a little over a year before stepping down in 1942 at age 63.